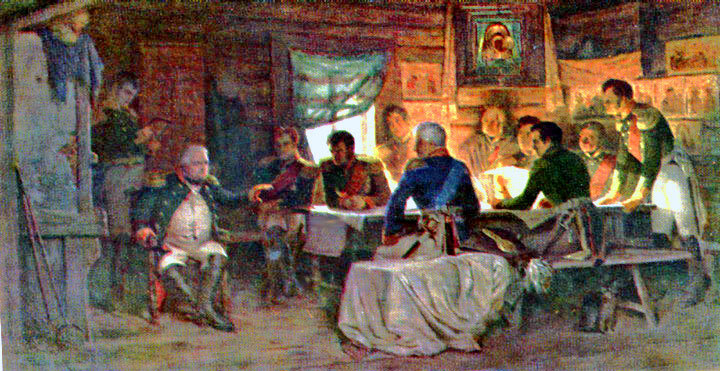 The painting depicting Kutuzov in conference with his staff in the hut at Fili prior to abandonment of Moscow. Painting by A. Kivshenko in 1880. Shown from left - P. S. Kaisarov, M. I. Kutuzov, P. P. Konovnitsi, N. N. Rayevski, A. I. Osterman-Tolstoi, M. B. Barkali-de-Tolli, F. P. Uvarov, D. S. Dokhturov, A. P. Yermolov, K. F. Tol' , L. L. Beningsin.